﻿Aquatic life from around the world will finally have the opportunity to witness humans in their own natural habitat. A new park, open and inviting to all humans will offer a never-before-seen window into the lives of these bipedal land walking creatures. Although similar in appearance to aquariums, this homorarium instead captures human life in a series of oxygen filed bubbles, nestled in three distinct zones of this new facility. These spacious vertically soaring air-pockets are complete with specially designed crenelated floor plates that allow views from all watery corners of the tanks. 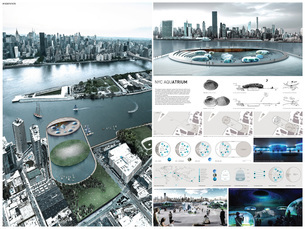 ﻿The NYC Dymaxion Aquarium & Waterfront park is an interesting proposal in designing a public icon in one of the dynamic areas in New York City. The project attempts to incorporate a cultural infrastructure with urban contexts to bring synergies to the neighborhoods. ​The proposal is inspired by the R.Buckminster Fuller's 'Dymaxion map', which is the first flat map to illustrate the Earth as one island in one ocean. The design respects the significance of the map, which developed into an architectural language to create an successful iconic destination within the city. The initial idea of this project is coming from the thoughts that the public space should be the place that has no hierarchy in access for non-targeted users, and not be the place that is unified by architects. Thus, this new aquarium should not be the one big finished space but ‘a room’ that has various notions like rhizome. Using three dimensional geometric fundamentals, it was possible to produce nonhierarchical connection between the park and other programs so that the programs that are topologically related have uniform and continual sequence at any starting point. Rejecting the typical hermetic approach to aquariums and museums, Tidepool Park aims to integrate instead of insulate. 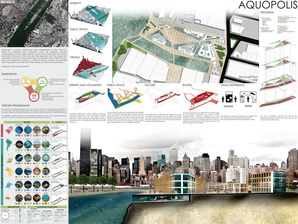 ​The interplay between park and aquarium takes cues from coastal tidepools. The aquarium and park are intertwine, with park space meandering between aquarium "boulders". Each of the boulders contains specialty exhibits, culminating in the Large Ocean Boulder, which also hosts ballroom and rooftop park with stunning views. The metal-clad tower houses the research center. The park slips over and around the bulk of the aquarium, offering continuous public access through the site. The landscape ranges from soggy pine barrens to beach dunes. 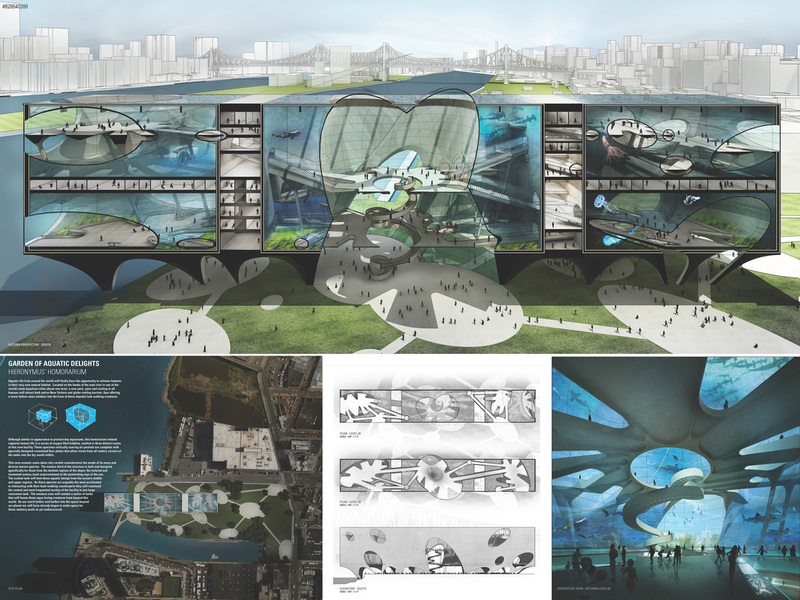 The project creates a dynamic system that interacts with its surroundings, offering multiple ways to experience the water world. 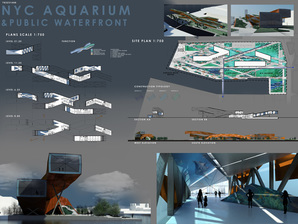 The site is excavated to become a large and unique water basin, with the Aquarium and the Marine Centre a submerged island accessed via a pathway. 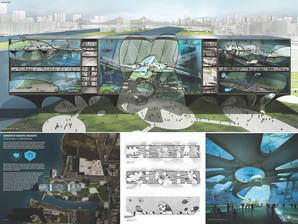 A sloping beachfront covers the Parking area to form a panoramic public space, while a boardwalk surrounds the basin and becomes a floating ring connecting the two waterfronts and encompassing the Aquarium and its sliding roof, a green island that closes to become a planetarium protecting the arena and the biome domes within. For the design of the New York Aquarium in Queens, we considered the controversy of the marine animals in captivity therefore, it was decided to reinterpret what today is considered an aquarium. We decided to opt for DIGITAL DISPLAYS that allow us to visualize the full scale maritime world, enabling a variety of educational exhibits without endangering the marine species. There has been research tied to find out if aquariums successfully promote conservation. Consistent visits to the aquariums prompts individuals to reconsider their role in environmental problems and conservation action because they see themselves as part of the solution. This concept of integrating an aquarium environment into an organization of mini-­‐city will create a more casual form of interaction between species and a user’s daily activities. 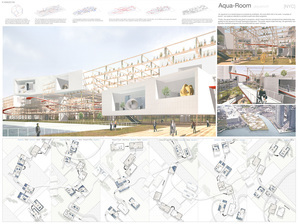 There will be more consistent exposure through unique programmatic hybridization of aquatic and mixed used amenities –thus resulting in daily influence and education in this project. 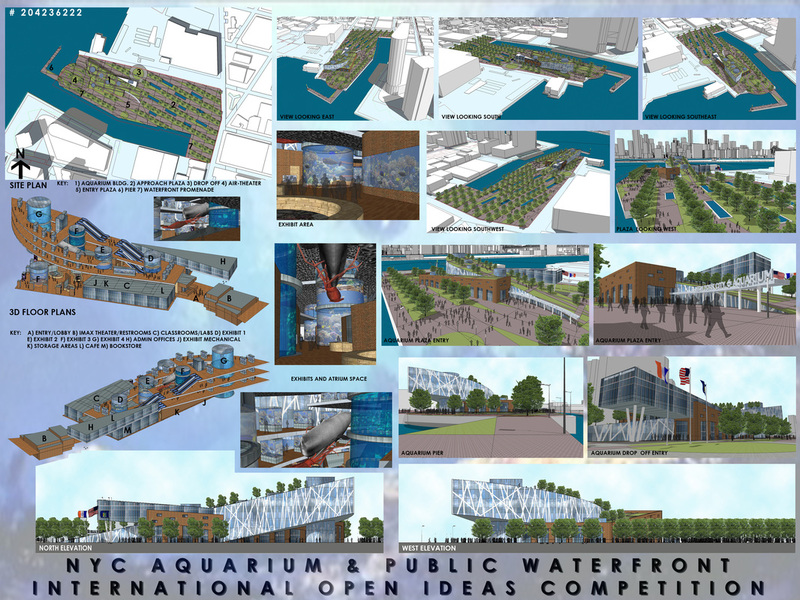 The idea is one place for community and learning of the aquatic nature. 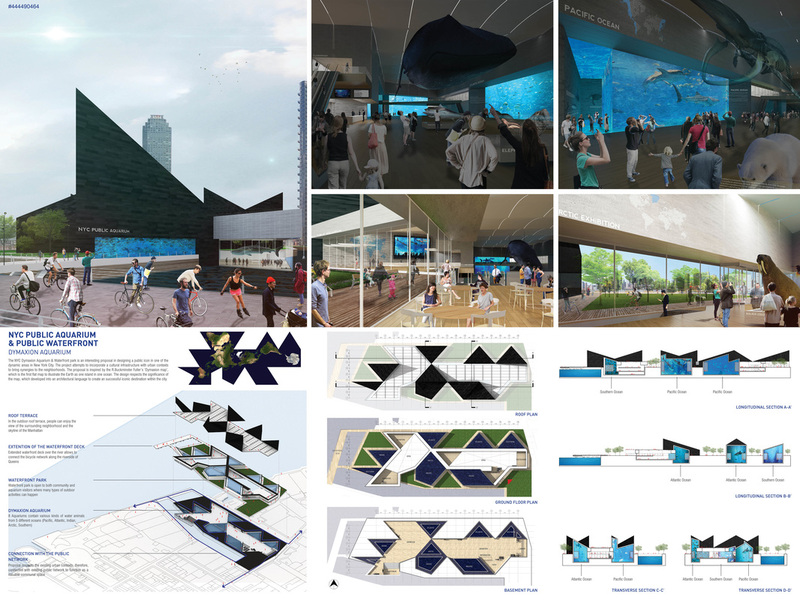 The project consist first in a buried aquarium with four exhibit spaces in two floors and lobby space, second two separated buildings for Marine Research and Center of Investigation, and finally a public space. Aquarium is crossed with slight circular slopes from first to fourth space and you flow among unnoticed floors under a green sustainable cover connecting with green islands where it is possible to meditate and see Manhattan. 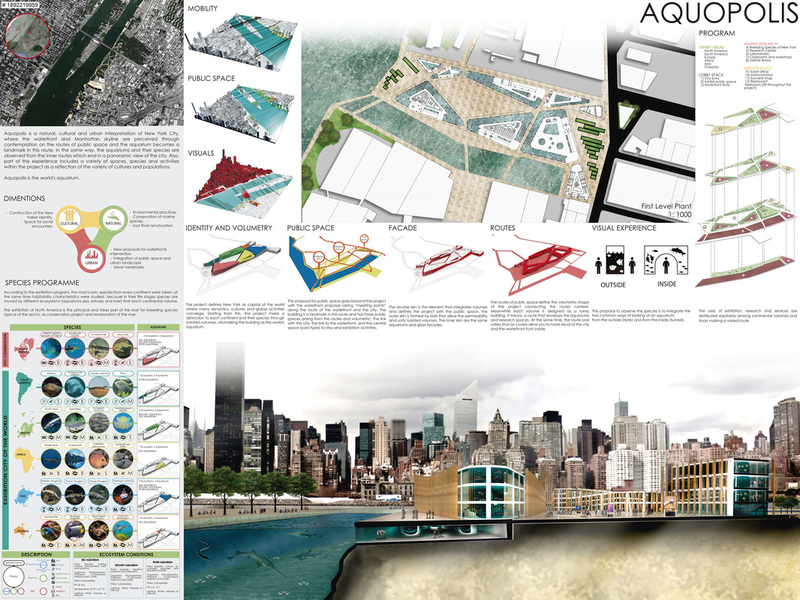 Aquopolis is a natural, cultural and urban interpretation of New York City, where the waterfront and Manhattan skyline are perceived through contemplation on the routes of public space and the aquarium becomes a landmark in this route. In the same way, the aquariums and their species are observed from the inner routes which end in a panoramic view of the city. Also, part of the experience includes a variety of spaces, species and activities within the project as a reflection of the variety of cultures and populations. 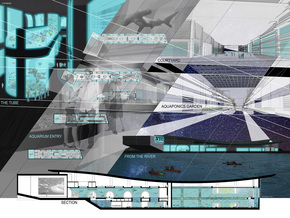 Aquopolis is the world's aquarium. 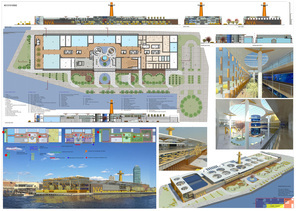 New York Aquarium, NYA, is likely a great ship, or submarine berthed in front of the Long Island docks. 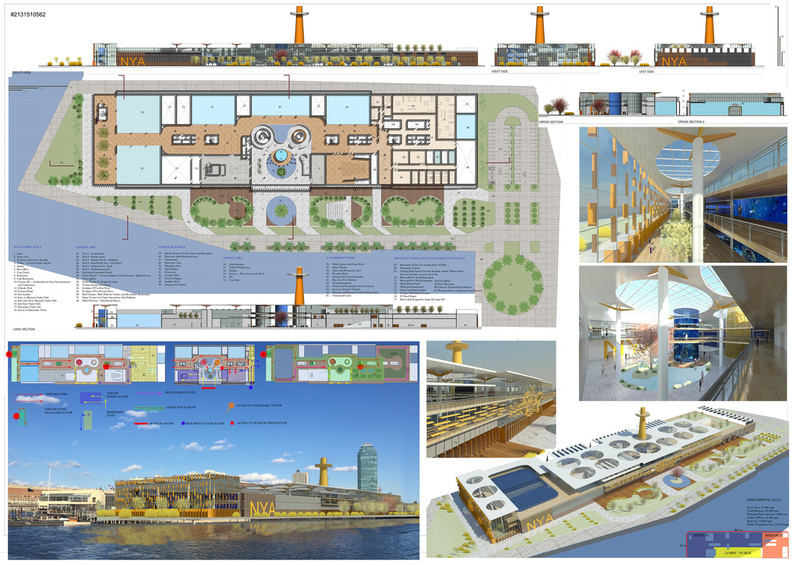 From the “ship” all visitors can start their wonderful sailing toward all the seas of the World, divided in six thematic areas split in geographical regions. The park-waterfront get inside the NYA through the central covered square, fulcrum in between Museum, public spaces and the Maritime Research Centre. All the visitors are invited to explore that fantastic ship walking through the promenade, the piers, the greenhouses up to the panoramic tower for a stunning view on the NYC Bay. 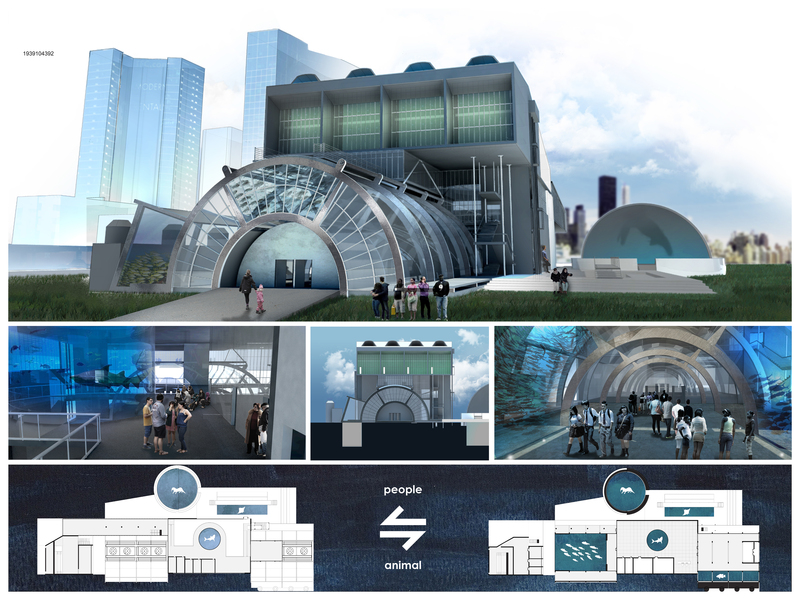 Our design for the aquarium began with a simple principle in mind – to create a non-intrusive landmark. 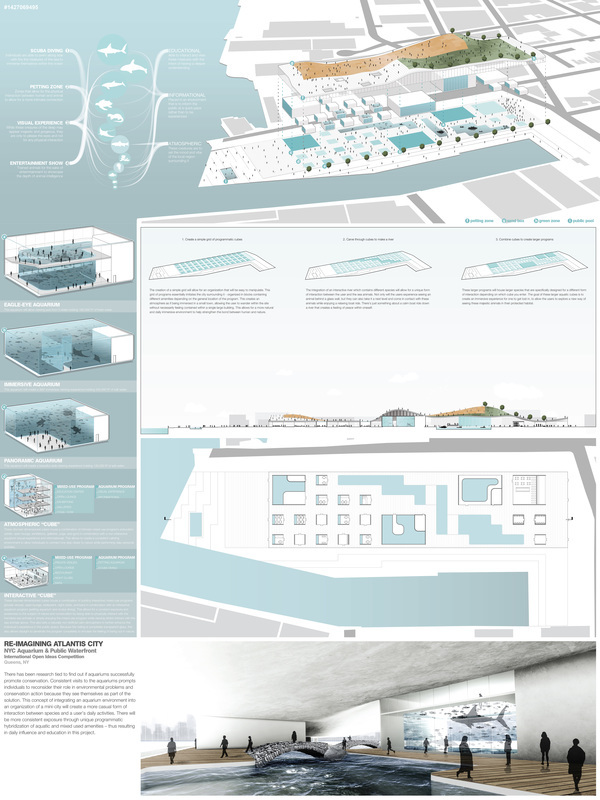 Consequently, we decided to base our design on our site’s relation with two main haptic elements; water mass and built mass. 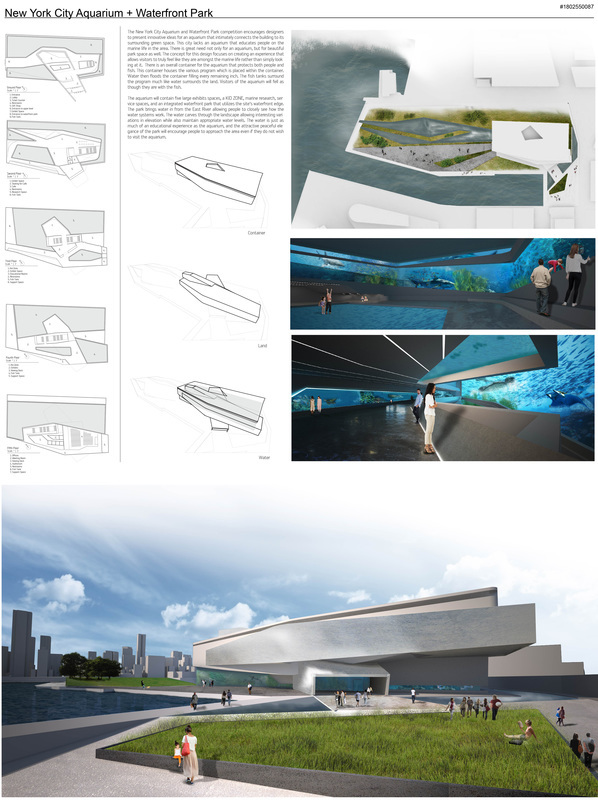 We imagined our structure as a previously-existing skyscraper that has toppled over, creating new spaces around and beneath it while also creating an experience of walking ‘in-water’ so as to amend the relation between human and river. 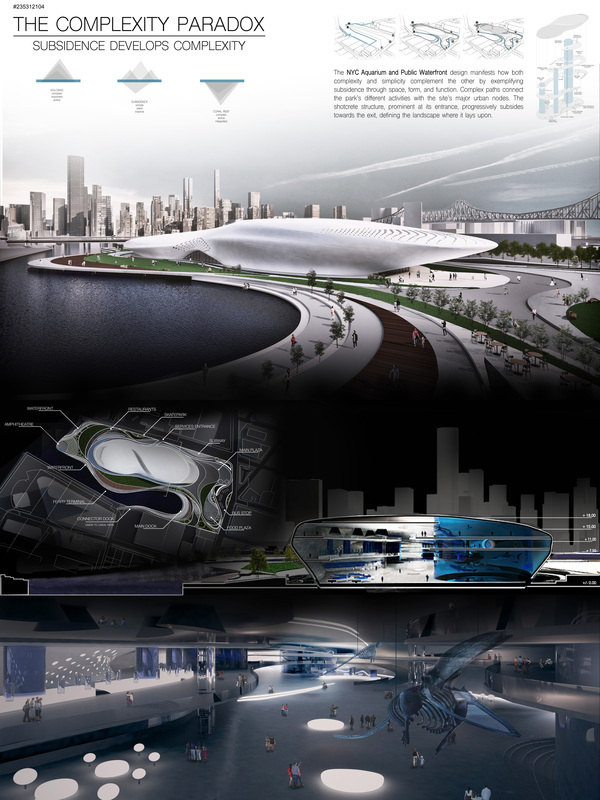 The result is a design that gives space back to the city while simultaneously offering a unique experience – a landmark by any other name. remaining inch. 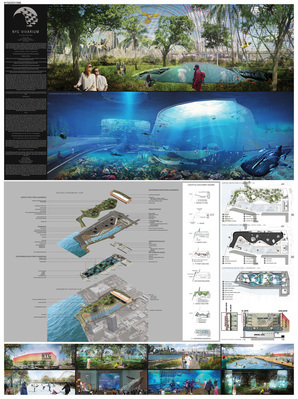 The fish tanks surround the program much like water surrounds the land. Visi tors of the aquarium will fell as though they are with the fish. Flexibility is considered in this design in order to resist the impact of hurricanes. The building is designed with a setback of 150 feet on the west side of the site, and the base is elevated 4 feet. 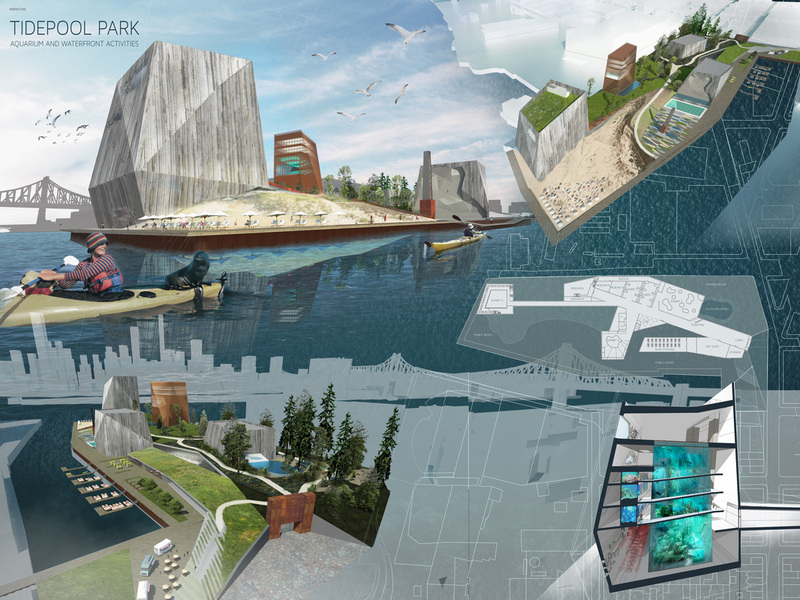 The setback area is designed as a coastal park to provide a public leisure space and protection. The sky wheel in this building keeps the continuation of the city’s sky-line, while also providing a perfect touring route and many view points for visitors. 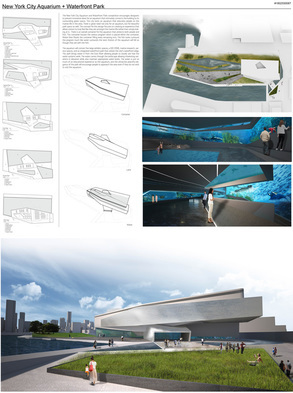 The concept of a streamline shape comes from waves, which helps define the building as a landmark. 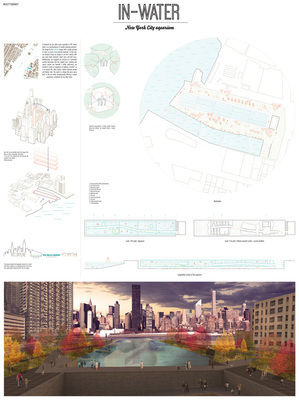 The Design combines two converging Borough city grids. “Geometry” is genesis of form and massing for park and building. “Grids” contribute overall organization of site relationship to building and surrounding neighborhoods. 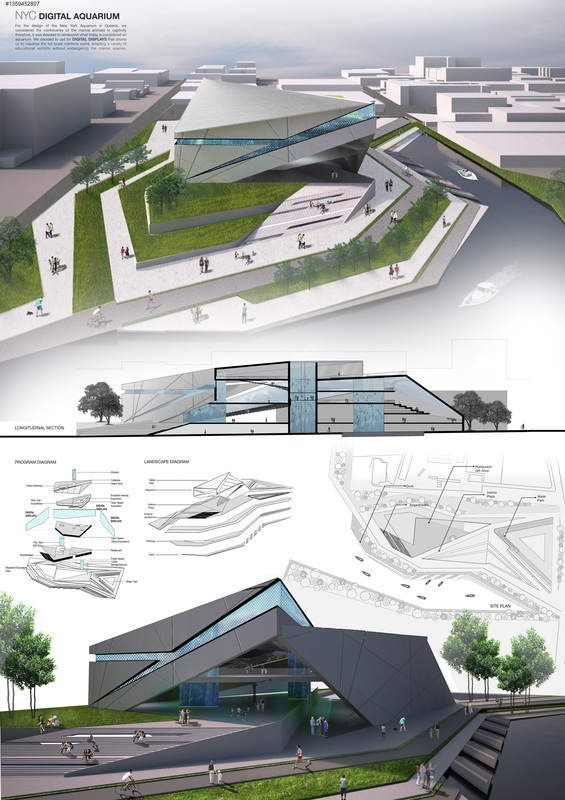 “Massing” form of building its image a sea creature “breaching” land as it would “breaching” waters surrounding its site. “Building” incorporates park landscaping as “skin” producing continuation and connection between the two. 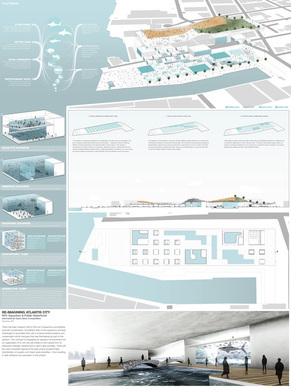 “Material” composition utilizes building’s relationship to brick warehouses while incorporating engaging newer components of other “breaching” elements of steel glass. This meeting of materials creates balanced play for old, new, and future and creates a “cultural destination”. 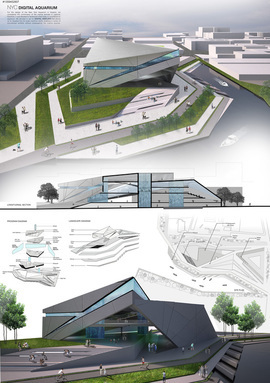 The building consists of three longitudinal, chaotically intertwining parts. The main goal of that was to provide semi-atrial calm spaces between the lower parts of the building and open, walk-able spaces on the top. The building is covered with triangular in shape rusted metal panels. This material reminds of the industrial history of the area. Waterfront park is a multi-functional space. The area that is closer to the water is designed more as a public space, with place for different cultural events such as an outdoor cinema. At the same time it creates an interesting space for relax next to the water, with terraces and greenery. 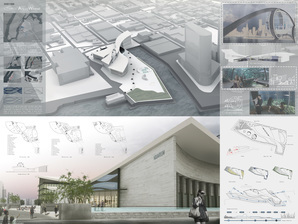 The proposal aims to reconnect and re-establish a natural environment and ecology where all living things coexist. 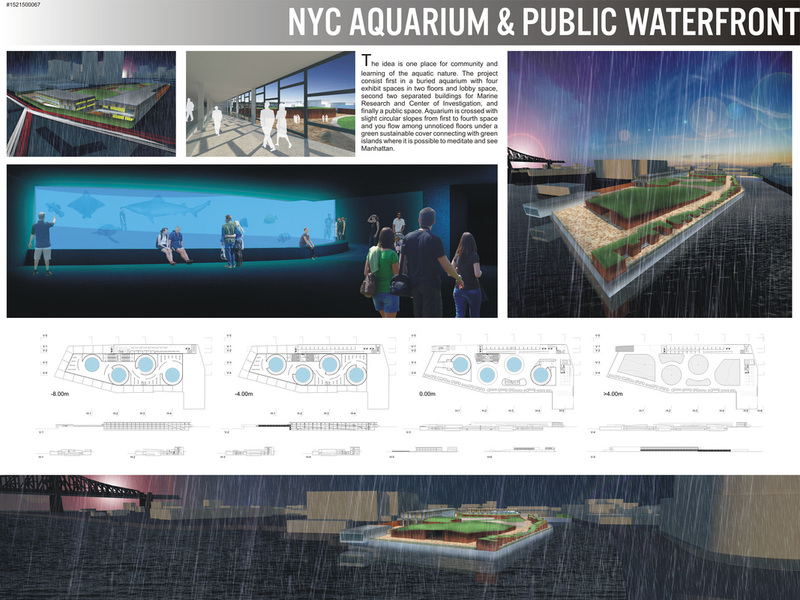 The traditional private nature of aquariums is challenged by proposing a surface public park that coexists with and sustains a subterranean water park below. In the surface public park, seen as the realm of humans, ‘ocean animals’ are on display, thus an aquarium (a place to relate to water). 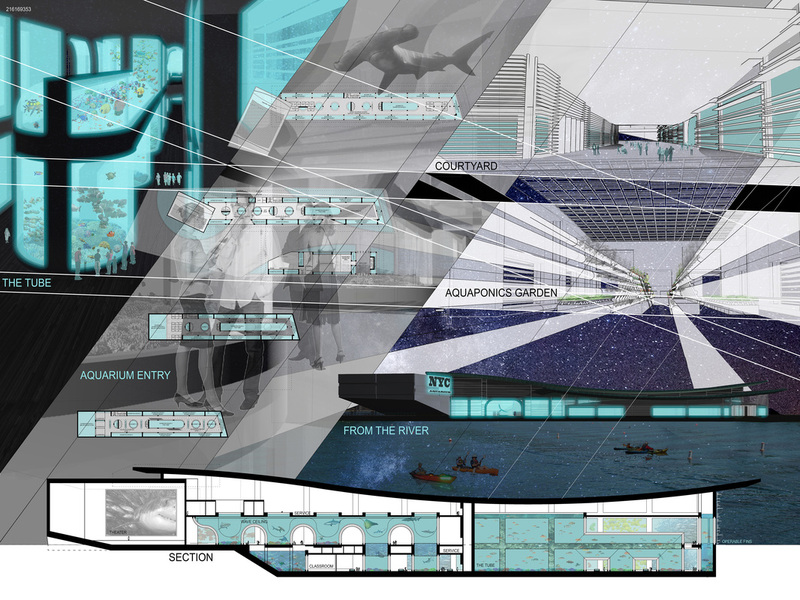 In the subterranean water park, seen as the realm of the ocean, humans are immersed into the experience of the ocean, and is therefore referred to as a “aquamergo” (immersive experience into water).